I wanted to take some time to upload some pictures and to show a visual history of the improvements I have made for my RES. Thanks largely in part to this site and all of the great people here. 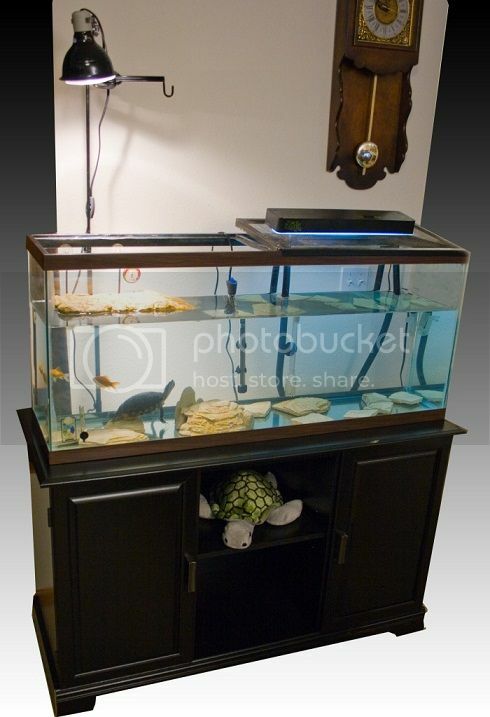 This first tank is just after I inherited the turtle. He came with a 20 gallon tank, a HoB filter that was rated for 20 gallons and some sea shells and a fixed temperature heater. I frantically read up on RES care and ran out to get a better filter some lights, thermometers, a basking platform and I made the mistake of buying "Turtle Rock" for his substrate. 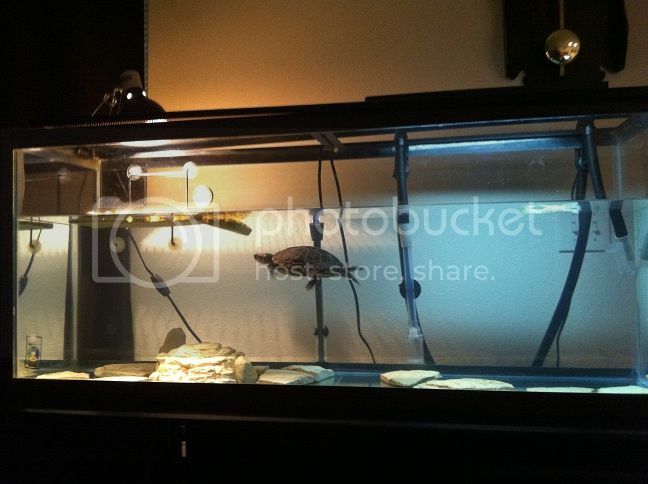 This picture was from October 2011, shortly after I got him and "upgraded" his original tank setup. 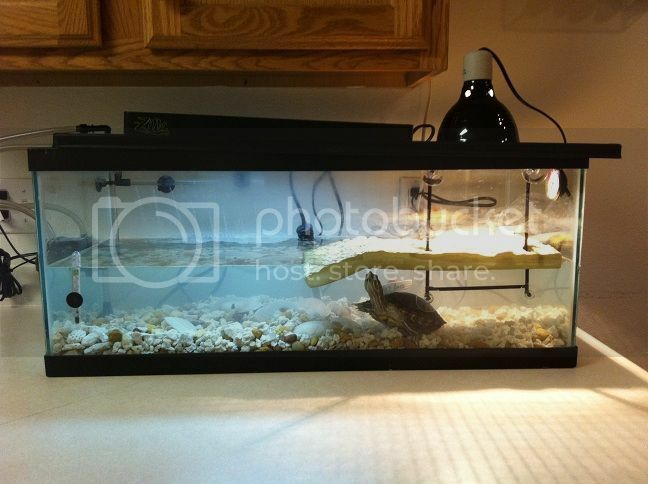 Franklin had a much better improved life, although I cursed his little body every weekend when I had to clean his tank. I quickly realized that the one ZooMed 501 "Turtle" canister filter was not going to cut it... So like an Idiot I figured well if one isn't enough then I guess I will go buy ANOTHER one so I had two for a long time and although it helped I was still cleaning two worthless filters almost every weekend plus complete water changes every other week.... After about two months of removing and cleaning the rock I finally ditched it and went with large stacking stones to use along the bottom of the tank. Fast forward 10 months, dozens of hours of pouring over this site and convincing my wife that our turtle needed more space. A friend hooked me up with a 55 gallon tank, I purchased and assembled an aquarium stand, purchased a larger heater and upgraded from the two inadequate ZooMed 501's to a Fluval 406. 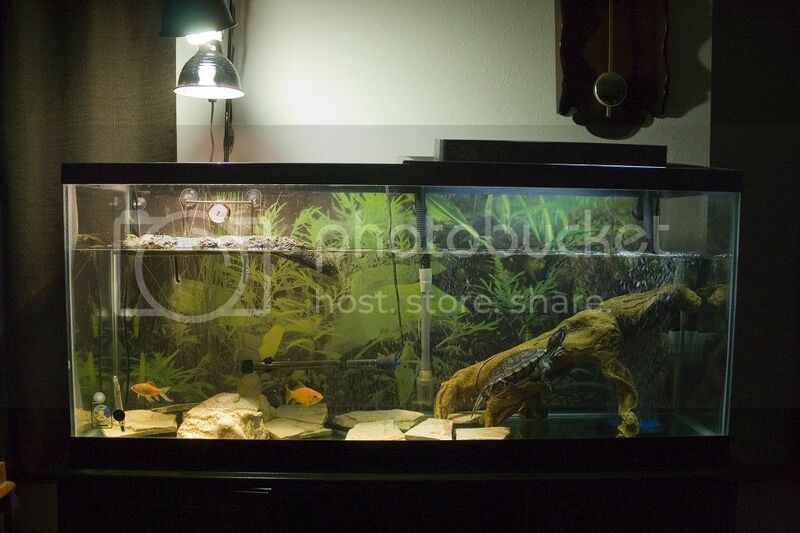 Here is the upgraded tank as of August 2012. After getting some valuable feedback and discovering that now that I had upgraded to a larger tank I no longer had adequate lighting for his basking area I went out and got more the appropriate lighting and a lamp stand (such a life saver). This meant I could have all the light I needed for my little guy and not need to keep a screen over the top of the tank. Here is the updated lighting setup. 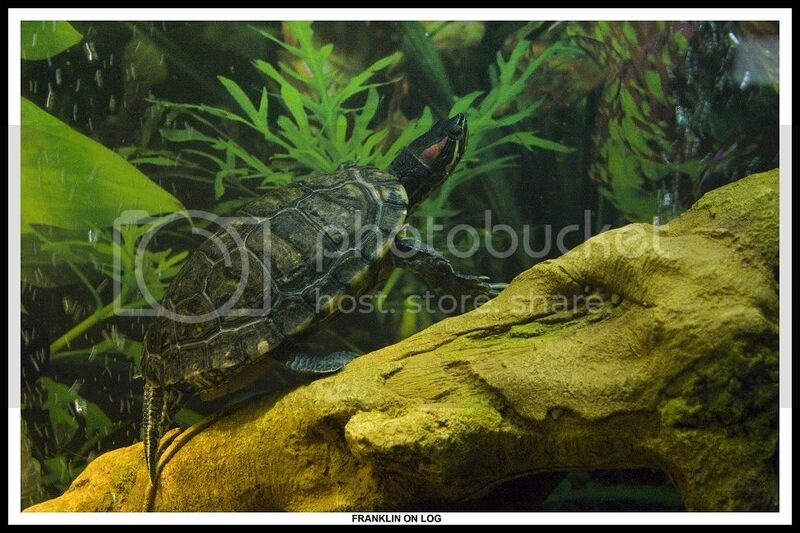 Franklin just loves his log. he spends so much time on that thing. Sleeping under it and on it, hanging by his back feet with his face down onto the bottom of his tank asleep. its his favorite toy. Thanks to Steve and VeipaCray as well as countless others who have shared their time and wisdom with me. I am so happy with how his home has turned out and I can tell each day that he is as well. The final setup is awesome man!! Great setup! is that piece of wood real? devilduck wrote: Great setup! is that piece of wood real? Hi. How does that amonia detector worked for you? hwwyahu wrote: Hi. How does that amonia detector worked for you? Honestly I think its a gimmick, I think the best way to test it is with a freshwater master kit. I put the thing in there. Followed every direction it gave and although I suspected my ammonia levels should have increased I never saw them change. As soon as I get a proper water testing kit I will be trashing it. Very nice progression, I think you've done a great job. Thanks Steve.... Ya know I just realized. I don't think I have ever seen pictures of your setup. 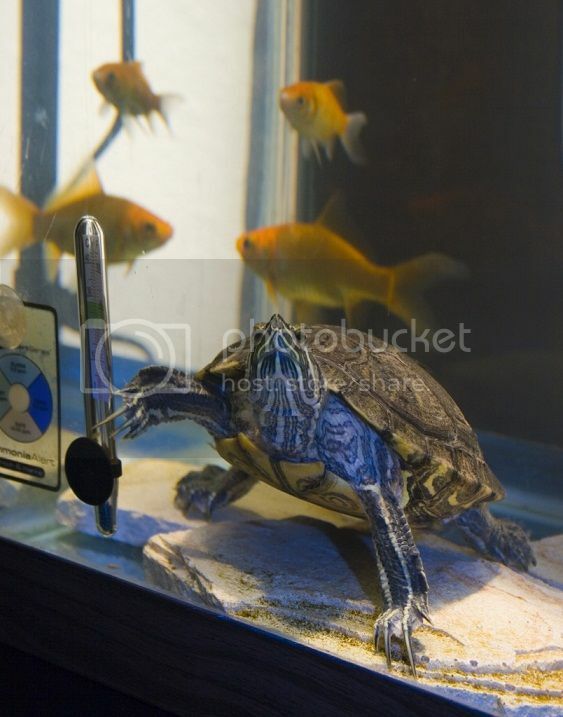 You have a fabulous tank set up. Well it seems that all of my hard work has paid off. I took Franklin into his first ever vet appointment this last Saturday to have a check up and to get him some Silver Sulfadiazine cream to treat the shell rot he has seemed to acquired to a small area at the top of his shell. So the vet weighted him and told me he was at a great weight and that he looks healthy and nothing that would indicate that he has any health issues. He did tell me that although he could give me the Silver Sulfadiazine cream he felt that using Povidone-Iodine Solution was just as effective and I could apply liberally to his shell and allow it to dry onto his shell for a couple of hours and them just allow him to go straight into the tank and the iodine would wash off in the tank with no ill effects. So treatment starts this weekend (now that I have gotten paid) He was very specific that it had to be the solution and not the scrub or the wash. He also told me that where ever I was getting my information on care was apparently a well educated resource as he has seen many turtle owners bring in turtles that had no idea how to care properly for their turtles. He also said that since I was doing such an excellent job caring for Franklin that he saw no reason to do an annual checkup with his office so long as everything continued to be normal. We talked about watching out for RI and how to spot that there may be an issue. So very glad I took him and and such a relief that my efforts have been validated by a professional. So thanks to everyone here for all of you help and feedback. This is just one more testament of proof that you are doing a good thing with this forum. MEandYouPhoto wrote: This is just one more testament of proof that you are doing a good thing with this forum. I agree; I wouldn't have the turtles I have today without the folks here, for sure. Good to see yours is doing so well!